At an informal meeting of 21 government pensions funds in Geneva, Switzerland, the topic of alternative lending was for the first time on the agenda. The funds discussed the risks and merits of allocating a small percentage of their investments in this asset class in the future. P2P-Banking learned that the managers of the Statens pensjonsfond Utland, the Norwegian Government Pension Fund, are considering to propose to call for an adaption of their investment rules to allow the investment of up to 0.3% of the funds money in innovative finance. A representative of the Australian Future Fund said, that investing to p2p lending marketplaces might be an interesting strategy in order to reduce the systemic risks that banks pose. However it would be much to all early to take this step now. Unconfirmed rumours say that even the very conservative management of the German Rentenversicherung is analysing the opportunity due to very low yield of other asset classes. A spokesman of a German opposition party stated ‘This is all fake news. There is no way that pension money will be put in this unstable investment. We will not allow it’. It would not be possible at the current size of the industry to allocate even a tiny fraction of the funds of these sovereign wealth funds, due to their sheer size. Demonstrants from the Swiss communist party were protesting loudly outside the conference hotel, claiming this is just a plot of banks to divert attention from their wrongdoings and scams. I attended Lendit Europe in London the last days, an industry event of the p2p lending (or marketplace lending) industry. This was my third Lendit and it was not only bigger (904 attendees from about 180 companies) but again better than the previous year. Samir Desai, CEO of Funding Circle in his opening keynote sees it as the golden age of the industry. And that certainly is the sentiment that much of the British part of the market would agree with. However there is headwind to be countered. 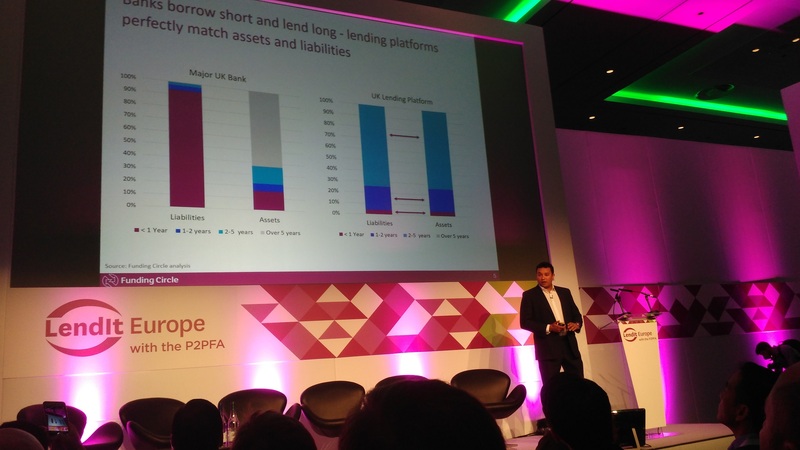 The P2PFA, the association of the UK marketplaces that co-hosts the event, comissioned a report on the economics of peer to peer lending. Christine Farnish, the Chair of the P2PFA said that they did this to rebuke assertions by facts and counter comments by the tradional industry about risks. The new Oxera report is available for free download here. Reinder van Dijk presented the findings of the report which focuses on the eight members of the P2PFA. He showed based on data, that in general the platforms did a good job on assessing risk, as the actual defaults for the years 2013 and 2014 were mostly in line or lower to the predictions the marketplaces made beforehand. Lord Turner, former head of the UK Financial Services Authority created a media stir earlier this year with a very critical remark on p2p lending. In his keynote speech Turner did a turnaround saying he had not fully understood the p2p lending model in detail at that time and that he thought the interview was over when he made the comment. His final message to the marketplaces is keep it simple and transparent. One major topic for the UK players is when FCA approval and the launch of the IF ISAs will occur. There is a feeling – but no certainty – that it’s getting closer. Farnish says she expects IF ISAs to be available by spring 2017. I also asked several people whether they expect it to be a big bang event, meaning that all the big players get approval at the same time to launch their ISA offer. Again there is no certainty but most respondents said they feel it would be only fair to grant the approval simultaneously because otherwise the first starter would have quite an advantage. By the way most of the sessions, panels and demos are available here as videos and can be watched free. I recommend Cormac Leech’s keynote as a data rich, not easy to digest, but highly informative appetizer. Then for a second course with some added spice injected by Kadhim Shubber, FT, watch James Meekings of Funding Circle, Giles Andrews of Zopa, Peter Behrens of Ratesetter, Christian Faes of Lendinvest and Anil Stocker of Marketinvoice here. And for a maximum of contradicting opinions during one panel you might finish here, where Cormac Leech suggests that p2p lending marketplaces should monetize by ‘bombarding’ users with cross selling offers, not only for fintech related offers but for example also selling holidays. He think the bombarded users would be receptive if only the marketplace at the same time gives them a better rate. (I might be compressing his argumentation, please watch it in full). This to me is a stretch. 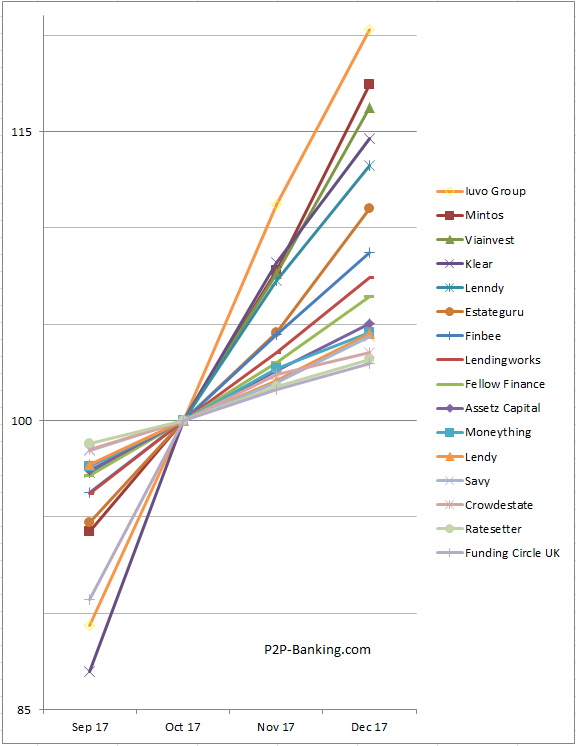 I think that p2p lending marketplaces should deliver what the investors expect from them: great returns. Surely there is some opportunity for cross-selling with related financial products. On the other hand I do believe that the challenger bank (Monzo) present in this panel has some merit with it’s plan to analyse data to make fitting offers based on the budget and the spending pattern of the customer. Will that appeal to everybody? Certainly not. But the customers that will sign up with them are looking for a change from their previous banking experience so they might be open to that. Another argument was on ‘pure’ marketplace lending model versus hybrid versus balance sheet based lending. While there are different opinions and preferences voiced, several speakers thought that there will be players of each type that are succeeding. I actually missed many of the afternoon sessions of the first day, because one main benefit of Lendit for me is the networking opportunity. I talked to many marketplaces I knew, to keep up with their developments and plans, and made contact with new marketplaces. My view is a bit biased on topics of interest of retail investors from the continent so I am overweighting platforms news that are revelant to these in the following paragraph. I checked with Saving Stream and they confirmed that they will lower interest rates with the intention to win more borrowers. The one size fits it all rate will be gone which takes away some of the straightforwardness/ease of use. I wasn’t told how much lower rates will go and on my question whether rates will vary depending on the loan risk, the answer was that this is yet undecided. Ed of Moneything said progress to growing loan volumes even further is good. Investly will disclose a new UI for investors soon. Aurora Exchange from Finland says it will not only launch there but will be able to serve all of Europe (not only from the investor side but also on the borrower side). I had so many conversations, that I missed most of the Pitchit, which I had really looked forward to see. But I was in time to see the pitch by Lendingwell which was very good and as it turned out the next day that was the pitch that won. I had the pleasure to moderate a panel on up and coming European platforms, this year featuring Creditshelf, Giromatch, Finbee and Viventor. I am looking forward to next year and am curious which great event location Peter Renton and his team will scout next time. ‘What happens when I die’ is a concern occasionaly voiced by investors. 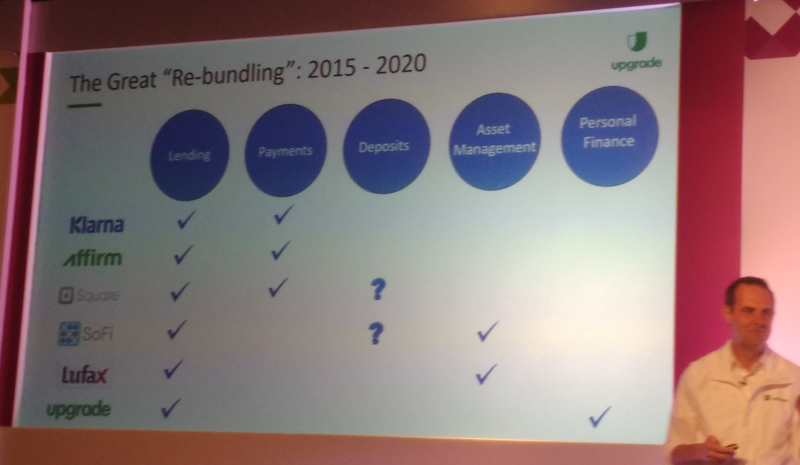 Investments in p2p lending will be inherited like any other assets. The concern for the investor is how readily their beloved ones will be able to access the funds. I scanned the FAQs of several p2p lending marketplaces but this is not one of the topics addressed. I then reached out to the marketplaces asking for information. 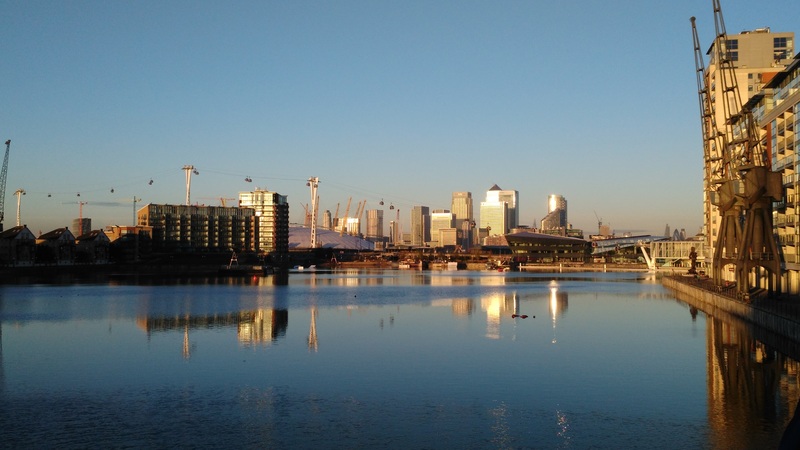 Ratesetter, Assetz Capital and Estateguru pointed out that the procedures are very similar to those applied by other financial institutions. Assetz Capital, after being notified about a death of an investor by the next of kin or a solicitor acting on behalf of the deceased estate will mark the account as deceased and suspend all marketing emails. The next step is requesting proof of death, most commonly provided in form of a death certificate and grant of probate. In the event that the decision taken is to liquidate the account then all account holdings are put up for sale. Any funds which can be released immediately are sent to the appropriate recipient and a monthly sweep of the account is carried out indefinitely until such time as all funds have been liquidated and released to the appropriate recipient. Martins Sulte, CEO of Mintos indicated that there are numerous different situations as the account is inherited according to the respective laws of the country where the investor resides. Tallinn based p2p lending marketplace Investly, which recently launched an invoice finance product in Estonia announced the launch of the service for UK SMEs. The invoice finance option will give UK businesses almost instant access to much needed working capital to aid growth. The launch comes after a successful European launch of the platform in Estonia 18 months ago, and a subsequent investment of 600,000 Euro from Venture Capital group, SpeedInvest. Until now, invoice finance options – whether through traditional channels or via other peer-to-peer platforms – have been complex and laden with fees and charges. Investly says it has simplified the product so that, once credit checks have been cleared, SMEs can sell invoices to investors within two days. And therefore assign the money to aid growth, enabling them to be the best they can possibly be without the cash flow worries. Initially, the invoice finance product will be available to any UK SME who passes the platforms sign-up criteria, which includes credit checks and confirming their identity. Further safeguards are put in place such as directors’ checks and potential guarantee. Are we headed for the next bubble? 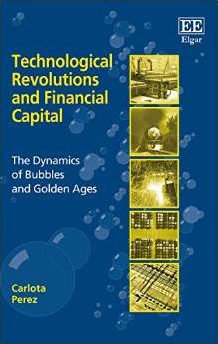 The book ‘Technological Revolutions and Financial Capital – The Dynamics of Bubbles and Golden Ages‘ won’t answer that question. But it does a good job analysing technological changes in the past and identifying patterns. The author Carlota Perez develops a model of the repeating interplay between finance and the drivers of technological evolution. Published in 2002 the book’s content seems timeless. I recently read it and can recommend it. Available at Amazon US, Amazon UK and Amazon DE.